Another thing that makes Lombok Island famous is the majestic mountain called Rinjani. It is located in the middle of the island in West Nusa Tenggara Province and has become tourists’ popular destination for numerous activities like hiking, sightseeing, photography, and lessening. However, not many travelers know some interesting facts regarding the mountain. It is true that most visitors are those who love hiking, but some people have a distinct reason for exploring it including to learn the legend of Goddess Anjani. Have no worries. This article covers some why this renowned mountain should be the prime attraction of the island. In terms of size, Rinjani Mountain is definitely big and vast. The most famous feature of the site is the presence of a peaceful lake called Segara Anak. Still, the mountain has other features like caves, lush trees, and savannas. This explains why visitors would be astonished during the exploration and they are likely to spend more time to get around the site. Not to mention the trekking route is considered easy, so everyone can enjoy hiking comfortably there. In fact, no local guide is needed as long as hikers have the basic experience to conduct such activity. So, what are the reasons to come to Rinjani Mountain of Indonesia? Aside from hiking, other fun activities can be including relaxation at Segara Lake. The location is near to the foot of the mountain and it has an easy access. No wonder, it becomes one of the most visited tourist sites for those who come to this area. The color of the lake is similar to that of the sea and it emits a soothing atmosphere as well. At this site, tourists can enjoy relaxation and a family recreation, which is a good alternative to hiking. 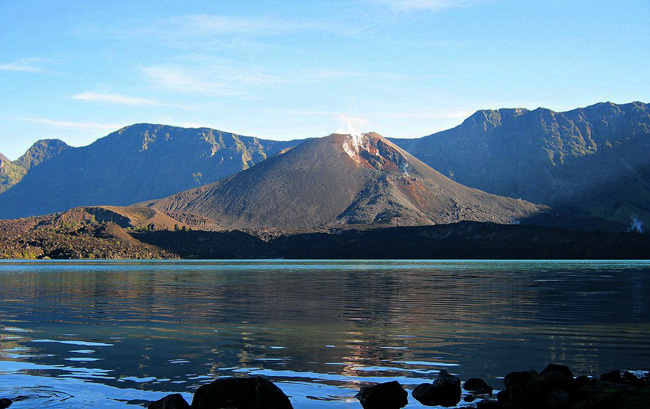 The next interesting site to explore in Rinjani Mountain is the Batujari Crater. It belongs to the small mountain located in the middle of Segara Anak Lake, after all. Despite the fact that tourists are not allowed to get near to such crater, they can simply watch it from afar. In fact, its beauty can compete to the peak of the Rinjani itself! If this not enough, tourists can enjoy the prime activity, which is trekking. Trekking activity in Rinjani Mountain gives an amazing experience to everyone, after all. Moreover, the trekking route of this site has been acknowledged by other countries. During the activity, visitors can see numerous types of tropical flora and fauna including the comfy rainforest. Later, at the end of the activity, tourists can relax and enjoy the natural hot spring located near to the Segara Anak Lake. What an experience! For those coming from Mataram City, West Nusa Tenggara, it takes about 4 hours to get to the entrance/gate of the Rinjani Mountain. The distance is 109 km, after all. For a faster trip, they can simply take Raya Mataram – Labuan Lombo Street.